Some customers say they weren't notified until they arrived at the airport. When Erin Levi booked a $179 one-way flight to Paris on Level airlines for a friend's wedding a few weeks ago, she joked that it was too good to be true. It was. When the travel writer arrived at Newark Airport on Sept. 9, she couldn't find her gate -- it was as if her flight didn’t exist. Levi, 35, had entered her information into the airline's website to check in hours earlier. She had run into an error message while trying to choose a seat but otherwise hadn't noticed anything unusual. 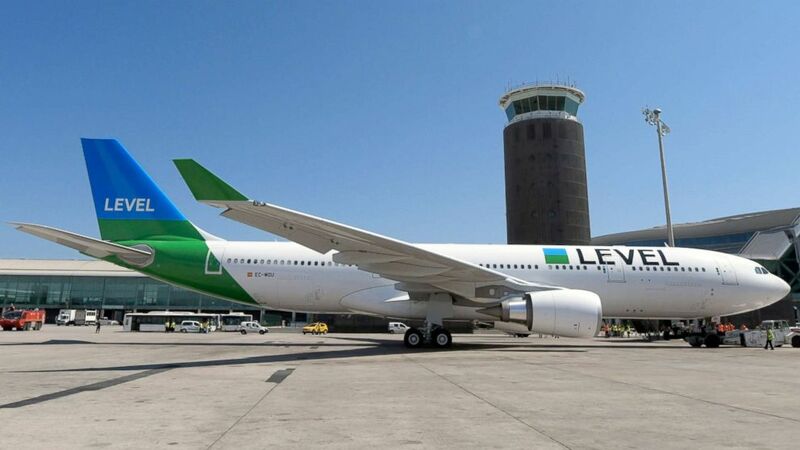 Unbeknownst to her, Level's launch of its Newark to Paris service had been delayed until Sept. 18, information that never appeared on the company's website. (Level Airlines) Erin Levi's flight confirmation for her Sept. 9, 2018 trip to Paris from Newark. Despite the low cost airline's confirmation, the carrier had delayed its Newark to Paris service to Sept. 18. "My flight doesn't exist!" she texted her friends from the airport. "Airline hasn't started transatlantic operations apparently!" At the airport, Levi couldn't find a counter or an agent for Level, so she double-checked her ticket. It read "OpenSkies," a boutique airline operated by British Airways. So she headed to their counter. It was there, she said, she was told Level had delayed launching the Newark to Paris route and was given a number to call. By that point, though, it was past midnight, and no one was answering the airline's hotline. So Levi bought a new ticket on Wow airlines, hoping to be reimbursed for the $319.98 she paid for the last-minute seat. "I've traveled to over 40 countries -- even on a handwritten ticket to Uzbekistan -- and this has never happened before," Levi told ABC News. (Level Airlines) A Level plane is pictured at an airport in this undated photo. But Levi is far from alone. Some Level customers said they never received emails saying that their flights had been canceled, or found out only upon arriving at the airport and being handed a sheet of paper. Others received emails that went to junk mail. Almost everyone ABC News spoke to said the company should have updated their website to reflect the change in business plans or cancellations. Level is owned by International Airlines Group, the European parent company of British Airways, Aer Lingus and Iberia Airlines. It is among the latest low-cost, long-haul carriers to begin offering transatlantic flights, joining a market served by companies including Wow, Primera Air, XL Airways, Norwegian and Air France subsidiary Joon. As these discount airlines have fought to compete amid widespread industry consolidation, corners have been cut -- and customers are often the ones who are most impacted. To its credit, Level has been forthright about its recent mistakes. (Level Airlines) A letter distributed at Newark Airport for Level Airlines customers to notify them that their flights were cancelled. The airline moved its inaugural Newark to Paris service launch date from Sept. 4 to Sept. 18, 2018. "Indeed, on August 20th, we took the prudent decision to postpone by two weeks the launch of our operations between Paris and New York, planned for September 4th, for operational reasons," Hugo Trac, Level’s communications and marketing manager, wrote in an email to ABC News. "Customers impacted by this launch delay have been alerted by email, sent to [the] address registered in their booking (or to the travel agency that did the booking)." "We sincerely apologise for the inconvenience caused and delay to our passengers’ travel plans,” Trac said, adding that the airline is offering a full refund for tickets and rebooking on an alternative flights for alternative dates. But sometimes, alternative dates aren't possible: Levi was heading to Europe for a wedding and needed to be there. She said that although she had received a confirmation email from the airline when she booked her flight, she never received an email about the cancellation. Other customers told ABC News they also showed up at the airport to find their flights were canceled. Some passengers said they did receive cancellation messages before setting off for their flights, but the notices were still so last minute they had to abruptly change vacation plans and spend much more than they'd budgeted. Florian Duval received an email 15 days before his trip from Paris to New York that his flight had been canceled -- but the email went to junk mail, so he didn’t see it right away. He bought a last-minute XL Airways round-trip flight for 345 Euros, about $403, roughly $134 more than his original ticket. Duval said he was struck by the confusion of his fellow passengers as they fought to get their tickets refunded. "Seeing that many people are affected by cancellations, and we are very poorly informed, I decided to create the Facebook group. And, above all, recommend everyone around me to never ever fly with Iberia-Level!" he said. The closed group Vols annulés Septembre [Canceled flights September] 2018 [Iberia via Level via OpenSkies] had 50 members as of Monday who said they were trying to get refunds from the company for their botched flights. Duval recently got a refund for his flight. Other passengers have united on social media, too. 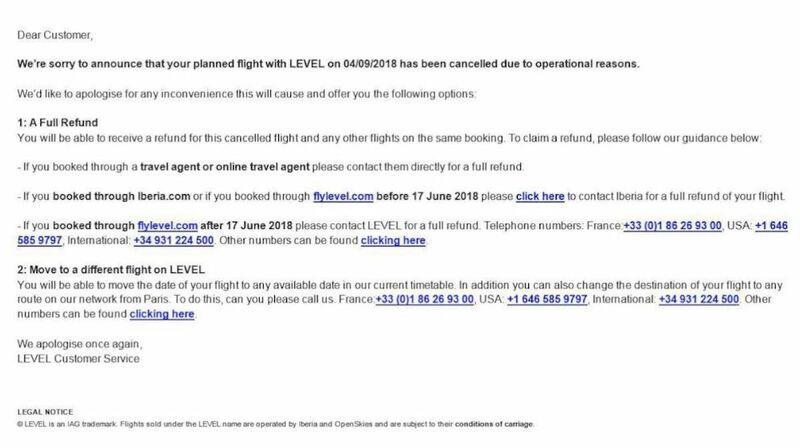 Passengers from canceled flights on Level's Montreal to Paris route have been extremely active and formed two Facebook groups: LEVEL vol annulé du 06/08 [Level canceled flights of June 8], which has more than a hundred members, and Level vol annulé 16 juillet 2018 [Level canceled flights July 16], which has nearly 200 members. 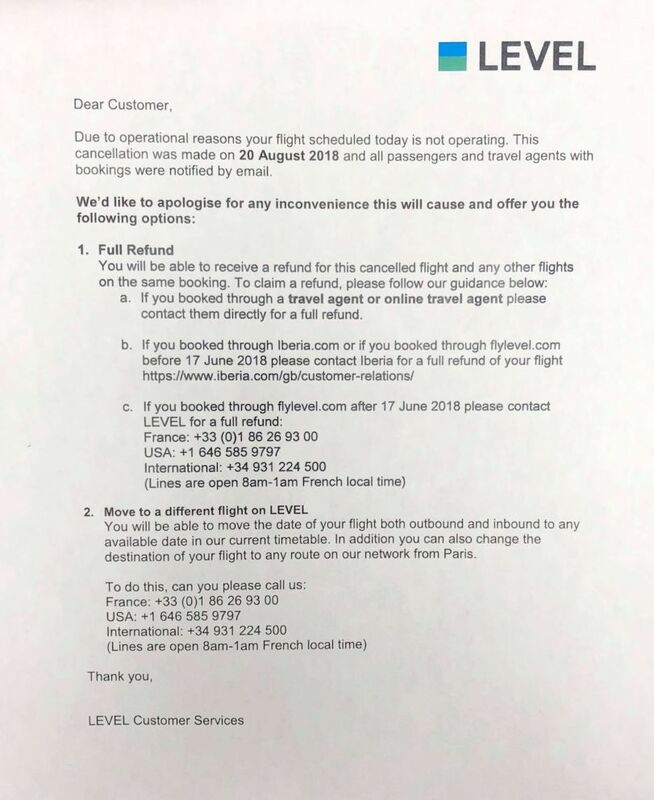 (Level Airlines) A letter distributed to Level Airlines customers at Montreal-Pierre Elliott Trudeau International Airport, announcing that its Aug. 8 flight to Paris was cancelled. Neela Parsnani said her Level flight from Paris to Montreal was canceled after passengers boarded for an hour. The passengers were shuttled to a hotel and promised dinner, but the restaurant was out of food, and her children went to bed after eating peanuts from the bar. Parsnani said she wasted vacation days sorting out re-routed flights and was forced to fork out for last-minute tickets from Montreal, cabs, meals and other expenses. When she went to get her refund from Level, she said she was asked to send several rounds of documentation to the company and jump through other hoops. "There's always a stupid reason not to pay us. At one point, I had to send my children's birth certificates. The communication with them is awful. They're amateurs," Parsnani told ABC News. Parsnani is now on a WhatsApp chat group with about 100 members from her canceled flight who share tips on getting refunds, she said. There's always a stupid reason not to pay us. At one point, I had to send my children's birth certificates. The communication with them is awful. They're amateurs. Similarly, Level's inaugural Martinique-Paris service was also delayed. "For same reasons as Newark, our operations to Martinique have been postponed, too," Trac wrote in his email to ABC. "First flight to/from Martinique was originally planned on September 3rd. It will now starts on October 1st." Yet as of Tuesday, the website said flights to and from Martinique would launch in September. Part of the problem echoed throughout the Facebook groups and interviews with more than a dozen stranded passengers is that the different operating companies add to the confusion. Some people booked their tickets on the Iberia Airlines website, some booked through Level's site and some booked through third-party sites like Expedia. Others passengers' tickets were issued through OpenSkies. But Level maintains that it has notified customers. "We applied the same process in terms of passengers' option[s] for both Newark and Martinique. An email has been sent to [the] passenger's email address filed in the booking details (or email [for] travel agencies if booking [was] done by them, as they are in charge of advising their clients). 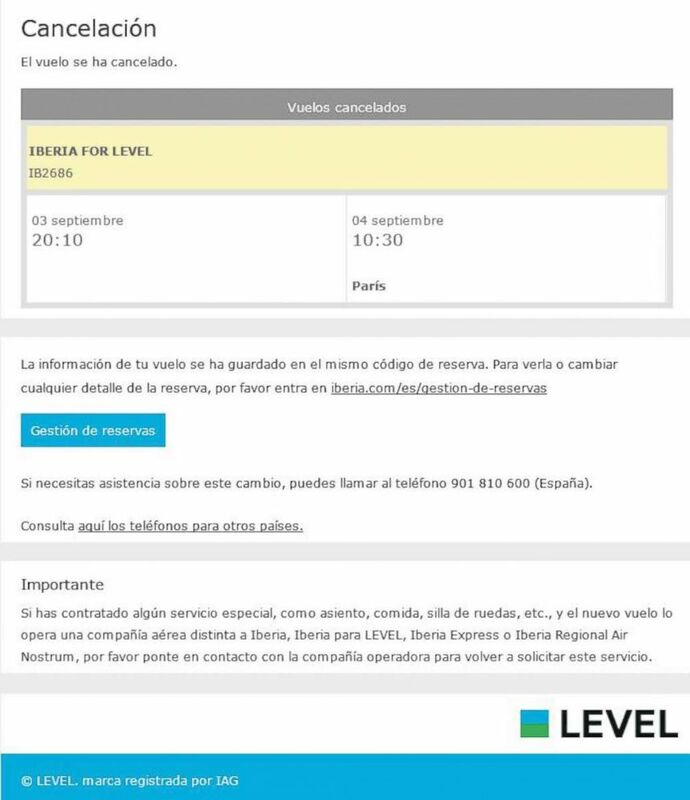 In communications sent to clients, [it] was mentioned that customers who purchased through a travel agency should claim a refund through the agency directly; customers who purchased through Iberia.com should contact Iberia for a refund and customers who purchased on flylevel.com claim a refund from Level directly," Trac wrote. "Our customer service is dealing with each request and every client will get an answer from our service." When asked whether Level had been overly ambitious and launched transatlantic service before it was ready, Trac wrote: "We offer transatlantic service with Level from Paris to Montreal and Guadeloupe since July 2nd. We needed to ensure the robustness of our schedule before we launch these additional routes (Martinique and Newark), which is why we took the prudent decision to delay their start." Pablo Ferreiro-Mazón, an architect from Galicia, Spain, learned this the hard way. He was already on vacation with his wife and son in the Caribbean. The family planned to island hop, so he booked an Aug. 17 Level flight from Paris to Guadeloupe, a route launched by Level in July. They booked a return to Paris from Martinique, Level’s new route, for Sept. 3. On Aug. 21, he received an email from the airline stating that their flights were canceled. (Level Airlines) In this photo dated Aug. 21, 2018 is an email Level Airlines sent to customers of its inaugural Sept. 3 flight from Martinique to Paris. With spotty cell phone service in Guadeloupe, he tried calling Iberia -- an airline he said he's flown his entire life and has some status with -- several times, which proved difficult and expensive. There was no direct number provided for a refund or alternate plans, he said, so he kept trying, with calls often costing 30 or 40 Euros each. After several days, Ferreiro-Mazón said, he got through to an agent who told them the Martinique service launch had been delayed and offered to rebook them for Sept. 23. "You cannot tell a family you have to stay there another 20 days," Ferreiro-Mazón, 53, said. Aside from the cost of the hotel, he and his wife, a doctor, had to go back to work and his son had to get back for medical school. "As you can imagine, we were quite desperate to find a way home." The family finally paid 401 Euros, about $466, to fly another airline back to Guadeloupe to catch the Level flight to Paris on Sept. 2. That meant cutting short their stay in the Caribbean, and sacrificing their pre-paid hotel and car rental. In addition, they flew back to Paris a day earlier and had to spend extra on a hotel room there before making their flight back to Spain, he said. But Ferreiro-Mazón said it's not about the money. "For a week, we were very worried about this situation," he said. "I don't know how to value that. You are on holiday, moving from one island to another. You are worried and you should not be worried about this on holiday."